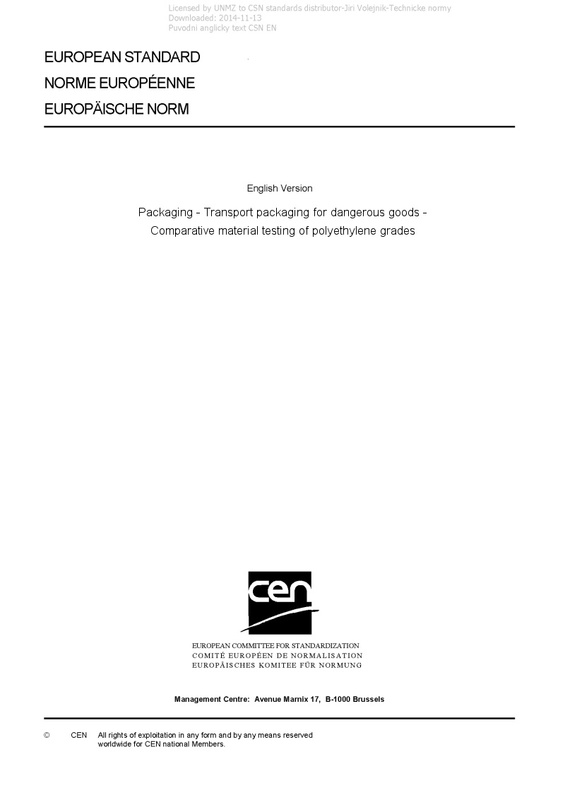 EN 15507 Packaging - Transport packaging for dangerous goods - Comparative material testing of polyethylene grades - This European Standard specifies material parameters, test requirements and procedures for the comparative testing of polyethylene grades of high molecular weight high density polyethylene (PE-HD-HMW) and medium molecular weight high density polyethylene (PE-HD-MMW), used for the manufacture of packaging and IBCs for the transport of dangerous goods. It is intended to be used in conjunction with selective testing for packaging for liquids. The standard is not intended to be used for comparative testing of recycled plastics material. NOTE This European Standard is intended to be used in conjunction with one or more of the international regulations set out in the Bibliography.